A copper alloy with a long-lasting warm, brown golden surface. Façade solutions in TECU® Gold give buildings a discreet value image. Aluminum siding is a form of metal exterior wall covering. 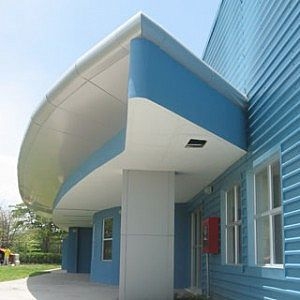 ArchiExpo offers a large selection of aluminum siding suitable for many different types of building. It comes in three broad categories: single skin, double skin and sandwich panels. This material is used primarily for commercial and industrial buildings. Aluminum siding is a form of metal exterior wall covering. It ensures mechanical integrity, impermeability to air and water, thermal and acoustic insulation and aesthetic qualities. Choice will depend on the type of building, the budget and architectural and environmental constraints. Panels may be installed horizontally or vertically, and come in a wide variety of form and color.